Very popular spring flowering bulbs, Wholesale Freesia bulbs are offered in a number of colours and flower forms in Australia. All are similar, with the double having more petals, the giants being larger and the normal freesia being easy care and reliable bulbs for landscaping or growing in containers. 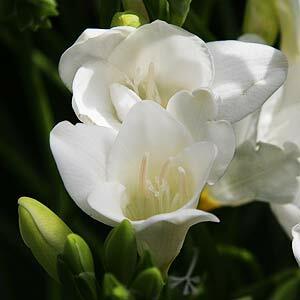 Available both in labeled packs for resale and in bulk for either resale of mass planting Freesia bulbs are available in a number of varieties from specialist bulb wholesalers in Australia. Usually available from late summer until late autumn, ready for planting for spring flowering. Freesias are also a part of many spring flowering bulb fund raiser packs available from wholesale growers. Bulk pack of 100 -1000 are available. Best planted in humus rich soil, in a position in full sun for the best flowers. Bulbs are planted from 5 – 10 cm apart depending on the density required. Freesias are also a popular plant for forcing indoors, they can be grown in freesia vases. Freesia Bulbs are available from the following wholesalers.